The AH-64 Apache is a four-blade, twin-engine attack helicopter with reverse-tricycle landing gear, and tandem cockpit for a crew of two developed for the United States Army's Advanced Attack Helicopter program. 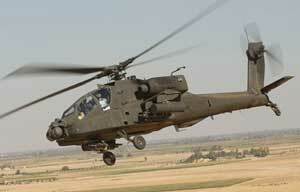 ISO Group provides spare parts and MRO solutions for the AH-64 Apache and all variants: AH-64A, AH-64B, AH-64C, AH-64D. ISO Group has experience in the AH-64 Apache Engine Assemblies, Rotables, Consumables, Avionics, Hardware, Landing Gear, Electrical Assemblies, Fasteners, and Structural Assemblies.